The post ‘Hackers Hijack Popular Chrome Extension to Inject Code into Web Developers’ Browsers’ published on August 3, 2017 by Graham CLULEY at the Tripwire blog ‘The State Of Security‘ gives another good reason for the use of Two Factor Authentication. Since phishing emails become better and better it is not surprising that even professionals can be tricked. Thus I can fully accept the developer’s answer ‘I stupidly fell for a phishing attack on my Google account.’ to the question ‘Any idea how this could have happened?’. But I cannot understand why the Google account was not secured with Two Factor Authentication (TFA), in particular because Google’s Push Notification makes life with TFA really easy. With TFA enabled, this cyber attack could have been prevented. Have a great week, and activate TFA for your Google account. This entry was posted in Opinion, Survival tips and tagged Google, Phishing, Two factor Authentication, Web Developer Chrome Extension on August 13, 2017 by Klaus Jochem. The report ‘German firms lost millions of euros in ‘CEO Fraud’ scam: BSI’ published in the Reuters Technology News on 10 July 2017 makes me really worry. Whaling, a special form of spear phishing aimed on corporate executives, is not new at all. For some samples see this slide show on CIO.com. It appears to me that in Germany the first line of defense, the employees, are not adequately prepared in the detection and the correct handling of phishing attacks, even though anti-phishing training is the most effective and cost efficient defensive measure in the fight against all kinds of phishing. Users should never act on a business request from a company executive if the email is not signed with a company owned and valid email certificate. Users should never trust an email of a business partner if it is not signed with the partners valid email certificate. Technical implementation is very easy, thus even SMB can use email signing in daily communication. This entry was posted in Advice for SMEs, Opinion, Survival tips and tagged Anti-Phishing training, Email signing, First line of defense, Phishing, Spear Phishing, Whaling on July 23, 2017 by Klaus Jochem. Whaling is a type of cyber fraud that targets mainly corporate executives. It is very closely related with phishing, thus not new. For a superb collection of examples see this slide show published on CIO.com. People. The most effective way to deal with whaling is security awareness training. Include some whaling attacks in your anti-phishing training to raise awareness. Never trust an email of a business partner when it is not signed with the partners valid email certificate. Communicate the IHP to all users and train them in use and handling of email certificates. Technology. Configure your email system such that all mails to external partners and at least all emails from company executives are signed with a valid email certificate. With this, the risk of getting the victim of a whaling attack is greatly reduced. This entry was posted in Advice for SMEs, Opinion, Survival tips and tagged Anti-Phishing training, Information Handling Policy, Phishing, Security awareness training, Whaling on December 4, 2016 by Klaus Jochem. On November 1, 2016 NSS Labs published the 2016 Web Browser Security Comparative Test Report. Two tests with the most popular browsers (Google Chrome Version 53.0.2785, Microsoft Edge Version 38.14393.0.0 and Mozilla Firefox Version 48.0.2) had been run to check how effective they deal with socially engineered malware (SEM) and phishing attacks. The results are of interest for end-users because the inbuilt browser features were evaluated in the test. When it comes to protection against phishing attacks the time needed until a URL is blocked is important. Microsoft Edge is the browser of choice, followed by Firefox and Chrome. In the second test the protection against Socially Engineered Malware was evaluated. Again, the average time to block the malware is of great importance, and again, Microsoft Edge is the browser of choice, followed by Chrome and Firefox. The average time to block is 0.16 hours for Microsoft Edge, 2.66 hours for Chrome and 3.76 hours for Firefox. Happy reading, and have a good weekend. This entry was posted in Advice for SMEs, Opinion, Survival tips and tagged Chrome, Edge, FireFox, NSS Labs, Phishing, Socially Engineered Malware, Web Browser Comparative Test on November 6, 2016 by Klaus Jochem. 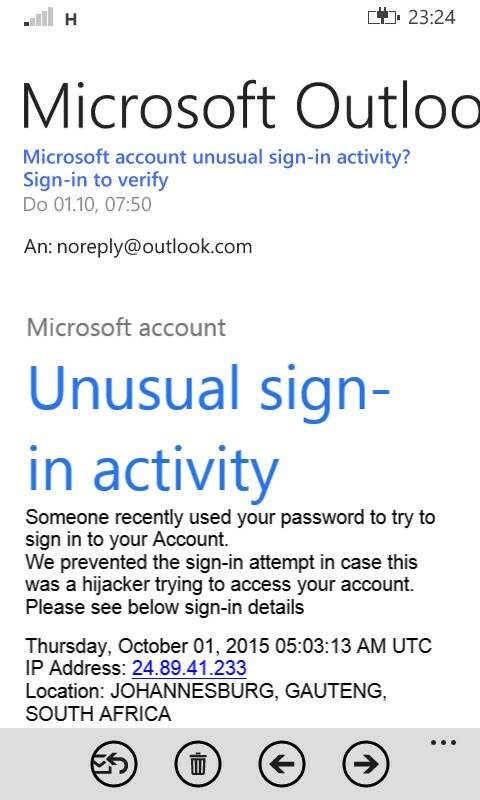 When viewed with mail apps on smartphones or tablets this well-made phishing mails look like the real thing. In my opinion most of the phishing attacks are easy to detect if email apps would offer the option to display at least the full <From> tag from the email header. It’s hard to understand why Google, Apple and Microsoft make their customer’s life more difficult than necessary. 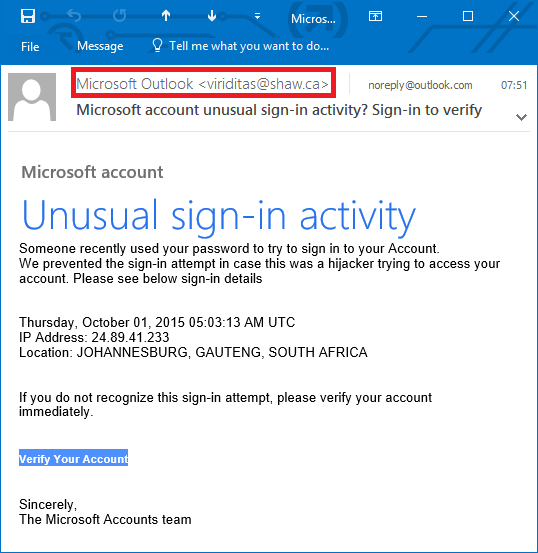 This entry was posted in Opinion and tagged Email Headers, Phishing, phishing attacks, Sender information on October 2, 2015 by Klaus Jochem. 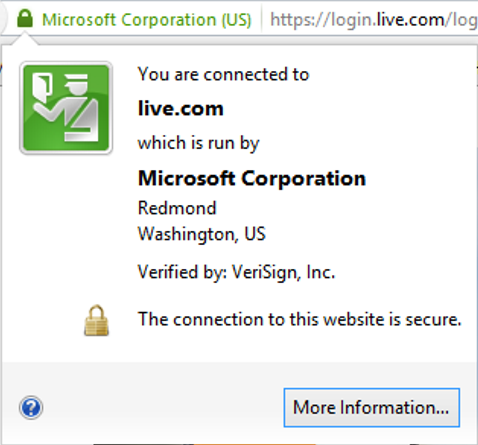 When a serious company requests login data the network connection is always secured. Clear indicator of a secured network connection is that the URL starts with the https protocol. In addition, the certificate information besides the URL provides reliable information about the company and the site which runs the service. The missing https protocol and certificate information in phishing URLs like http://videoservicesmiami.com/bolu/HOTMAILFILES/HOTMAILFILES/login.srf.htm is a clear indicator that someone tries to trick you. Password fields present on an insecure (http://) page are a security risk. Firefox Browser Console Security Warning. Click to enlarge. I would appreciate it if the Firefox programmers would warn the users with a message box of such security risks, and block loading of such sites. This would be a great step forward because malicious URLs are often difficult to recognize in emails. This entry was posted in Puzzling discussions, Survival tips and tagged Certificate, FireFox, Firefox Browser Console, Https, Phishing, phishing attacks on July 11, 2015 by Klaus Jochem.